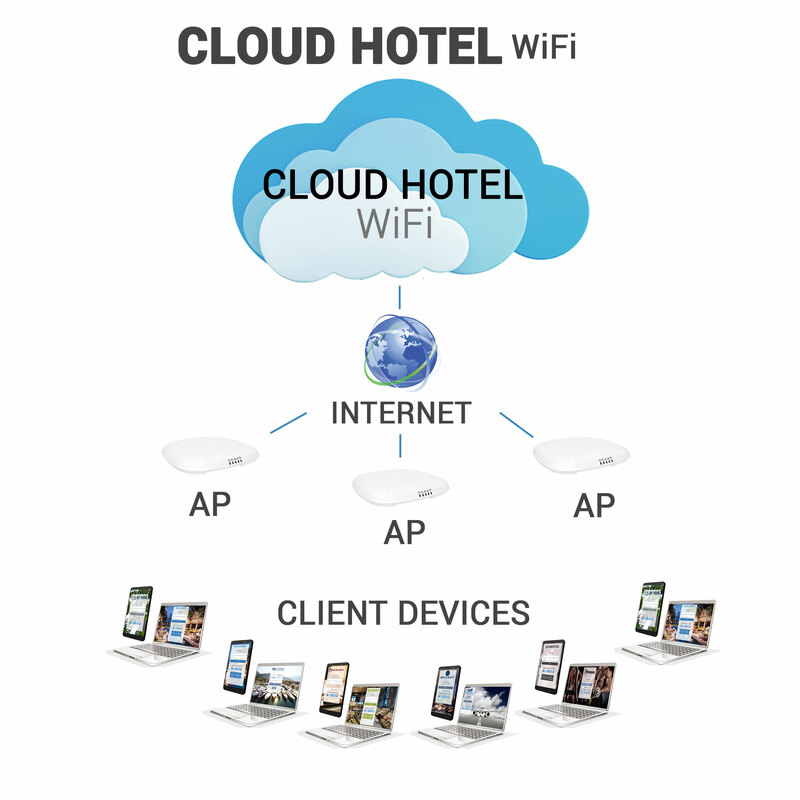 Cloud Hotel WiFi or On-Premise Server – choice is yours! Add Hotel WiFi Hotspot PC to your network and start controlling entire installed WiFi network, no matter which APs are used. You manage the system, our tech support is available online. Build a free guest WiFi using social login, shared keywords, SMS or Email verification, or offer a faster paid WiFi access with a credit card or PayPal payments, pre-printed tickets, Hotel PMS integration with room/name. 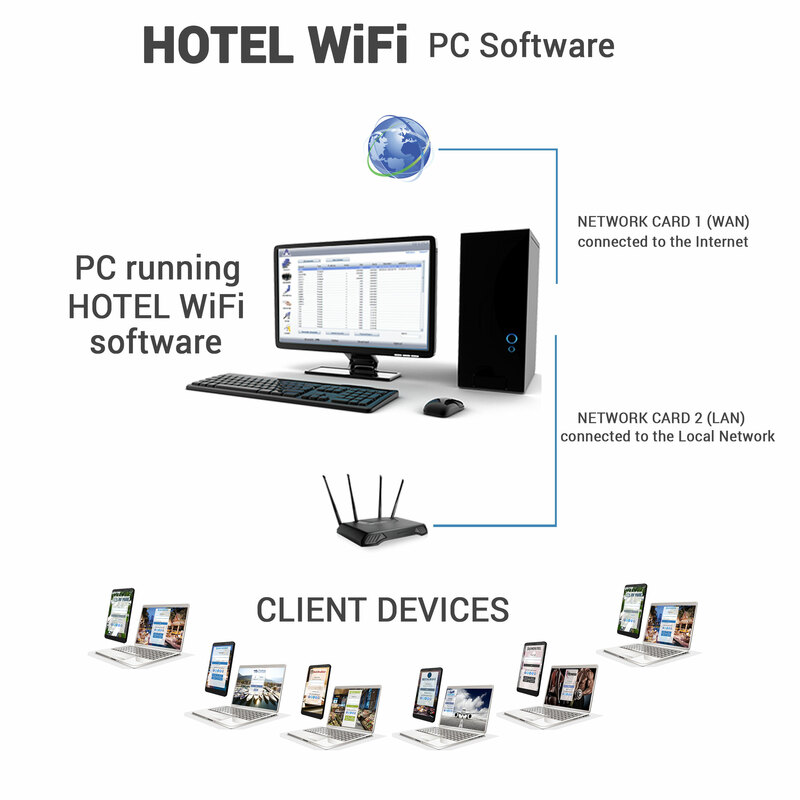 How to setup: Hotel WiFi Hotspot software needs to be a gateway PC with two network cards. PC runs between Internet modem/router and Wi-Fi devices in your network. Customers are redirected to your self-branded login page to sign-in or pay before getting the Internet access, or automatically login with remaining quota and time. Connect supported APs, routers to the Cloud Hotel WiFi system and manage your WiFi from any device. Cloud Hotel WiFi solution controls user Internet access, sets limits, processes payments, engages users, provides powerful analytics and helps you run different marketing strategies to maximize revenue from your WiFi. Configure your APs, brand your pages with logo and background, choose how will customers login – Social network, video ad campaigns, login code vouchers, or setup billing.